Shannon Hubbard has complex regional pain syndrome and considers herself lucky that her doctor hasn't cut back her pain prescription dosage. It started with a rolled ankle during a routine training exercise. Shannon Hubbard never imagined it was the prologue to one of the most debilitating pain conditions known to exist, called ­­­­­­­complex regional pain syndrome. It's a condition that causes the nervous system to go haywire, creating pain disproportionate to the actual injury. It can also affect how the body regulates temperature and blood flow. For Hubbard, it manifested several years ago following surgery on her foot. That's a common way for it to take hold. "My leg feels like it's on fire pretty much all the time. It spreads to different parts of your body," the 47-year-old Army veteran says. Hubbard props up her leg, careful not to graze it against the kitchen table in her home east of Phoenix. It's red and swollen, still scarred from an ulcer that landed her in the hospital a few months ago. "That started as a little blister and four days later it was like the size of a baseball," she says. "They had to cut it open and then it got infected and because I have blood flow issues, it doesn't heal." She knows that soon it will happen again. "Over the past three years, I've been prescribed over sixty different medications and combinations, none have even touched the pain," she says. She holds up a plastic bag filled with discarded pill bottles — evidence of her elusive search for a solution to the pain. Hubbard says she's had injections and even traveled across the country for infusions of ketamine, an anesthetic which can be used for pain in extreme cases. Her doctors have discussed amputating her leg because of the frequency of the infections. "I've tried the other treatments. All I can do is manage the pain," she says. "Opioids have become the best solution." For about nine months, Hubbard was on a combination of short- and long-acting opioids. She says it gave her enough relief to start leaving the house again and do physical therapy. But in April that changed. At her monthly appointment, her pain doctor informed her the dose was being lowered. 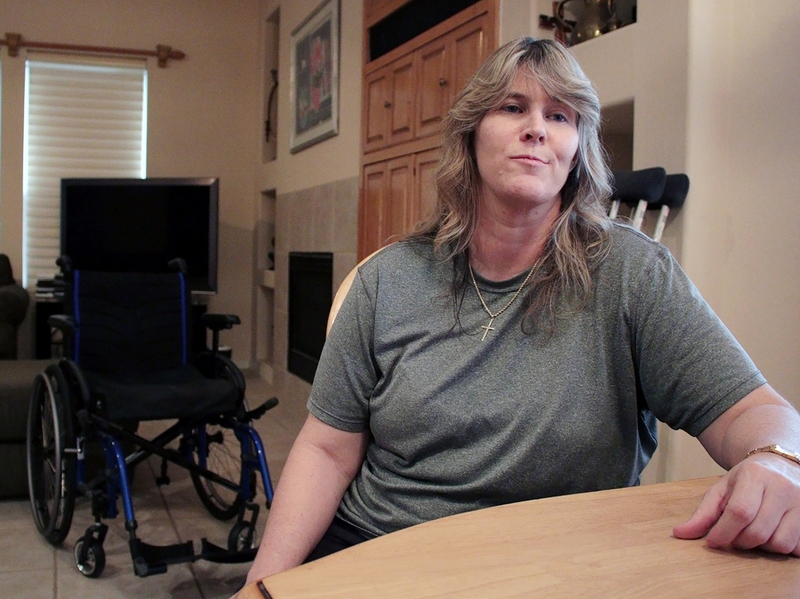 "They told me because of the new Arizona law they had to cut me back," she says. "They had to take one of the pills away. That had a huge impact on my pain." Hubbard knew about those rules. They're part of the state's new opioid law, which places restrictions on prescribing and limits the maximum dose for most patients. She also knew the law wasn't supposed to affect her — an existing patient with chronic pain. Hubbard argued with the doctor, without success. "They didn't indicate there was any medical reason for cutting me back. It was simply because of the pressure of the opioid rules." Hubbard's dose was lowered from 100 morphine milligram equivalents daily (MME) to 90, the highest dose allowed for many new patients in Arizona. She says her pain has been "terrible" since they lowered her dose. "It just hurts, I don't want to walk, I don't want to ... pretty much don't' want to do anything," she says. Hubbard's condition may be extreme, but her situation isn't unique. Faced with skyrocketing drug overdoses, states are cracking down on opioid prescribing. Increasingly, some patients with chronic pain like Hubbard say they are becoming collateral damage. More than two dozen states have implemented laws or policies limiting opioid prescriptions in some way. The most common is to restrict a patient's first prescription to a number of pills that should last a week or less. But some states like Arizona have gone further by placing a ceiling on the maximum dose for most patients. The Arizona Opioid Epidemic Act was passed earlier this year with unanimous support. The law was the culmination of months of outreach and planning by state health officials. It started in June of 2017, when Arizona's Republican Governor Doug Ducey declared a public health emergency, citing new data, showing that two people were dying every day in the state from opioid overdoses. He's pledged to come after those responsible for the rising death toll. 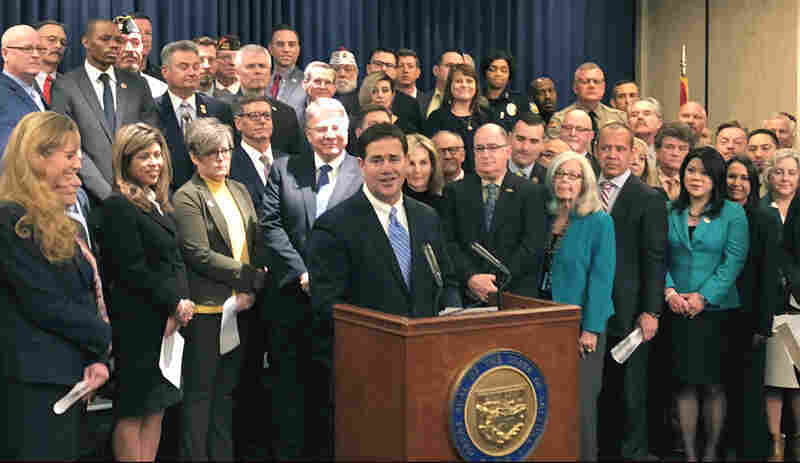 "All bad actors will be held accountable — whether they are doctors, manufacturers or just plain drug dealers," Ducey said in his annual State of the State address, in early January 2018. The Governor went on to cite statistics from one rural county where four doctors prescribed six million pills in a single year, concluding "something has gone terribly, terribly wrong." Later in January, Ducey called a special session of the Arizona legislature and in less than a week he signed the Arizona Opioid Epidemic Act into law. He called it the "most comprehensive and thoughtful package any state has passed to address this issue and crisis to date." Initially, Arizona's major medical associations cautioned against what they saw as too much interference in clinical practice, especially since opioid prescriptions were already on the decline. Gov. Ducey's administration offered assurances that the law would "maintain access for chronic pain sufferers and others who rely on these drugs." Restrictions would apply only to new patients. Cancer, trauma, end-of-life and other serious cases were exempted. Ultimately, the medical establishment came out in favor of the law, which passed unanimously. Since the passage of the law, some doctors in Arizona report feeling pressure to lower patient doses, even for patients who have been on stable regimens of opioids for years without trouble. Dr. Julian Grove knows the nuances of Arizona's new law better than most physicians. A pain doctor, Grove worked with the state on the prescribing rules in the new law. "We moved the needle to a degree so that many patients wouldn't be as severely affected," says Grove who's also president of the Arizona Pain Society. "But I'll be the first to say this has certainly caused a lot of patients problems, anxiety," he says. "Many people who are prescribing medications have moved to a much more conservative stance and unfortunately pain patients are being negatively affected." Like many states, Arizona has looked to its prescription monitoring program as a key tool for tracking overprescribing. State law requires prescribers to check the online database. Report cards are sent out comparing each prescriber to the rest of their cohort. Clinicians consider their scores when deciding how to manage patients' care, Grove says. 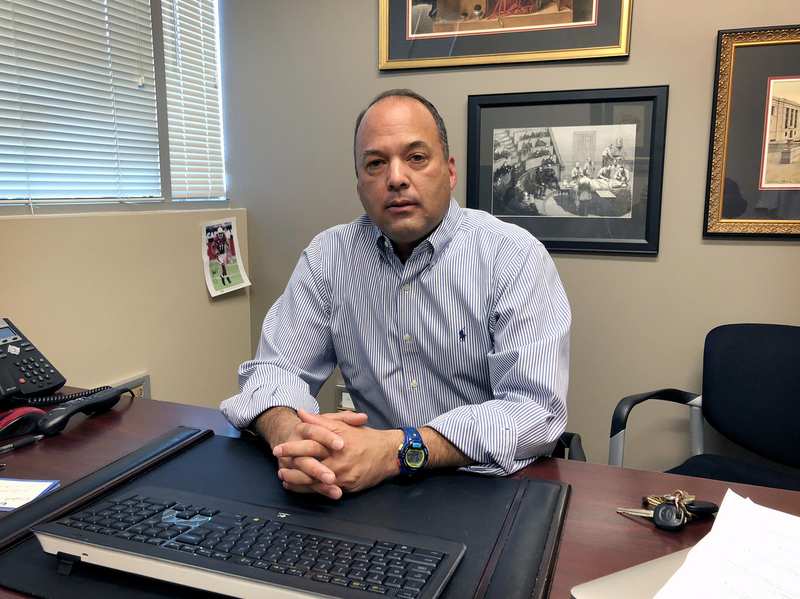 "A lot of practitioners are reducing opioid medications, not from a clinical perspective, but more from a legal and regulatory perspective for fear of investigation," Grove says. "No practitioner wants to be the highest prescriber." Julian Grove, MD, a pain specialist, says that doctors were already facing pressure on many fronts to reduce treatment by opioids in Arizona. Arizona's new prescribing rules don't apply to board-certified pain specialists like Grove, who are trained to care for patients with complex chronic pain. But, says Grove, the reality is that doctors — even pain specialists — were already facing pressure on many fronts to curtail opioids — from the Drug Enforcement Agency to health insurers down to state medical boards. The new state law has only made the reduction of opioids "more fast and furious," he says. "They have been grossly misinterpreted," says psychiatrist Sally Satel. Satel, a fellow at the American Enterprise Institute, says those guidelines stipulated the decision to lower a patient's dose should be decided on a case-by-case basis, not by means of a blanket policy. The guidelines were not intended for pain specialists, but rather for primary care physicians, a group that accounted for nearly half of all opioids dispensed between 2007 and 2012. "There is no mandate to reduce doses on people who have been doing well," Satel says. She says in the rush to address the nation's opioid overdose crisis the CDC's guidelines have become the model for many regulators and state legislatures. "It's a very, very unhealthy, deeply chilled environment in which doctors and patients who have chronic pain can no longer work together," she says. Satel calls the notion that new prescribing laws will reverse the tide of drug overdose deaths "misguided." "They are often looked to as a strategy that can make an enormous impact on the problem, and that is not true," she says. In fact, the rate of opioid prescribing nationally has declined in recent years, though it still soars above the levels of the 1990s. Meanwhile, more people are dying from illicit drugs like heroin and fentanyl than prescription opioids. In Arizona, more than 1,300 people have died from opioid-related overdoses since June of last year, according to preliminary state numbers. Only a third of those deaths involved just a prescription painkiller. Some physicians are supportive of the new rules, according to Pete Wertheim, executive director of the Arizona Osteopathic Medical Association. "For some, it has been a welcome relief." he says. "They feel like it has given them an avenue, a means to confront patients." Some doctors tell him it's an opportunity to have a tough conversation with patients who they believe are at risk for addiction or overdose because of the medication. The organization is striving to educate its members about Arizona's prescribing rules and the exemptions. But he says most doctors now feel like the message is clear: "we don't want you prescribing opioids." Long before the law passed, Wertheim said physicians were already telling him that they had stopped prescribing, because they "didn't want the liability." He worries the current climate around prescribing will drive doctors out of pain management, especially in rural areas. 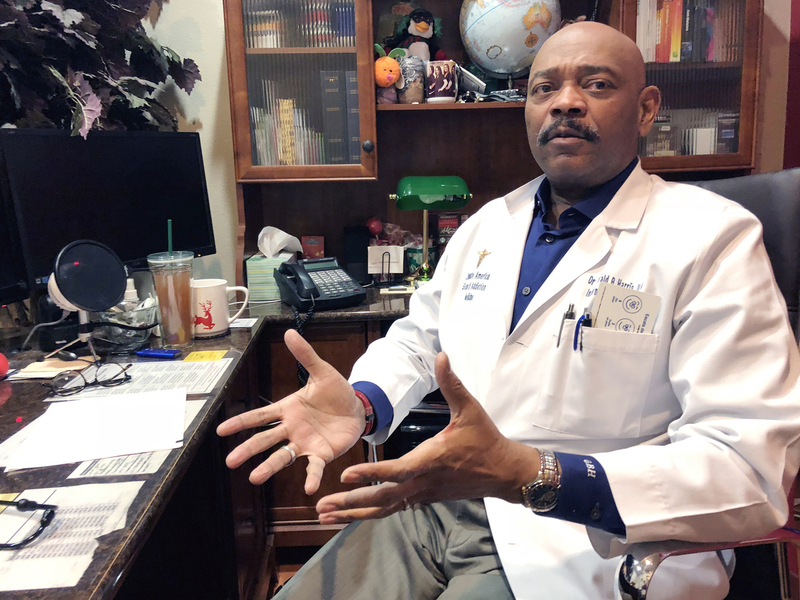 There's also a fear that the current climate will push some patients who can't get prescription pills to try stronger street drugs, says Dr. Gerald Harris II, an addiction treatment specialist in Glendale, Ariz. He says he's seen an increase in referrals from doctors concerned that their patients with chronic pain are addicted to opioids. Harris also receives new patients — almost daily, he says — whose doctors have stopped prescribing altogether. "Their doctor is afraid and he's cut them off," he says. "Unfortunately, a great many patients turn to street heroin and other drugs to self-medicate because they couldn't get the medications they need." Gerald Harris II, DO, specializes in treating addiction in Glendale, Az. He says he's seen an increase in referrals from doctors concerned that their patients with chronic pain are addicted to opioids. Arizona's Department of Health Services is working to reassure providers and dispel the myths, according to Dr. Cara Christ, who heads the agency and helped design the state's opioid response. She points to the recently launched Opioid Assistance and Referral Line created to help health care providers with complex cases. The state has also released a set of detailed prescribing guidelines for doctors. Christ characterizes this as an "adjustment period" while doctors learn the new rules. "The intent was never to stop prescribers from utilizing opioids," she says. "It's really meant to prevent a future generation from developing opioid use disorder, while not impacting current chronic pain patients." Christ says she just hasn't heard of many patients losing access to medicine. It's still too early to gauge the law's success, she says, but opioid prescriptions continue to go down in Arizona. Arizona saw a 33 percent reduction in the number of opioid prescriptions in April, as compared to the same period last year, according to state data. Christ's agency reports more people are also getting help for addiction. There has been about a 40 percent increase in hospitals referring patients for behavioral health treatment following an overdose. Shannon Hubbard, the woman living complex regional pain syndrome, considers herself fortunate that her doctors didn't cut back her painkiller dose even more. "I'm actually kind of lucky that I have such a severe case because at least they can't say I'm crazy or it's in my head," she says. Hubbard is well aware that people are dying everyday from opioids. One of her family members struggles with heroin addiction and she's helping raise his daughter. But she's adamant that there's a better way to address the crisis. "What they are doing is not working. They are having no effect on the guy who is on the street shooting heroin and is really in danger of overdosing." she says. "Instead they are hurting people that are actually helped by the drugs." This story is part of a reporting partnership with NPR, KJZZ and Kaiser Health News.